To commemorate Doraemon's 30 birthday, “My Doraemon” robot is on sale in Japan. Having a height of 16cm, it is design to sit on your office desk. He maybe small in size but it has fictions that can command 31,500 yens which is about $600 SGD. 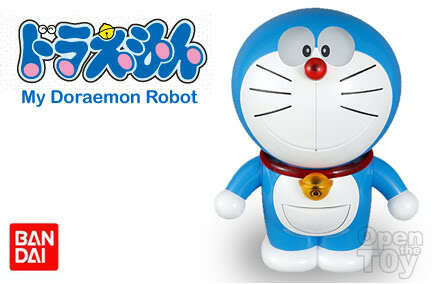 This Doraemon is built with multiple sensors for motion, light, heat, and sound with make him intelligent. It has a clock in his body and depending on the time, he will react differently to you such as greeting Good morning, Good Afternoon or Good Night. He is capable to hold a basic and decent conversation in Japanese (yet more to scripted) such as when you said "Let’s go outside and have fun" and Doraemon may reply such as "No sorry I prefer staying at home and watch anime". Now imagine he had1300 Japanese phases, think about the possibilities. When there is a change in temperature such as you take him out of an air con room, he will sense there is a change of temperature and Doraemon will report the new temperature. This Doraemon is also attentive to you when he talk to you. He do so by remaining his eye contact on you even when you move around in the room. When you stroke his touch sensor on the head, he will give you a happy expression. The facial expression counts on two small LCD (LCD) that do the type of eyes expression of Doraemon in the Anime and Manga and a total of ten different emotions. Although it is called a "Robot", this Doraemon neither can walk or move its arms but it does turned his head automatically as he speak but the mouth remain smiling. How's this Robotic Cat from the future for you? Check out for video here or order one can go here or here. Here's some sighting of Doraemon in Japan by Muza-chan. You mean you love the plushes which is the soft toys?